Big celebrities visited Atlanta, Georgia on Sunday to witness the Super Bowl 53. Dressed in matching purple suits, UFC superstar Conor McGregor and his son graced the Mercedes-Benz Stadium and showed some support to the New England Patriots. “The Notorious” has been handed with a six-month suspension and a $50 000-fine by the Nevada State Athletic Commission last week, but it looks like he is still living the best of his life following the NSAC decision. Over the years, Conor McGregor has been seen watching games at the National Football League. Days after his fourth-round submission loss to Khabib Nurmagomedov last October, he visited the AT&T Stadium and cheered for the Dallas Cowboys on its showdown with the Jacksonville Jaguars. Conor was seen in the sidelines talking to Cowboys’ owner Jerry Jones. Reports then revealed that the Irish star had told Jones that it is now the time for the Ultimate Fighting Championship to hold an MMA show at the stadium. But on Sunday, “The Notorious” rooted for a different squad as the Cowboys were already out of title contention. 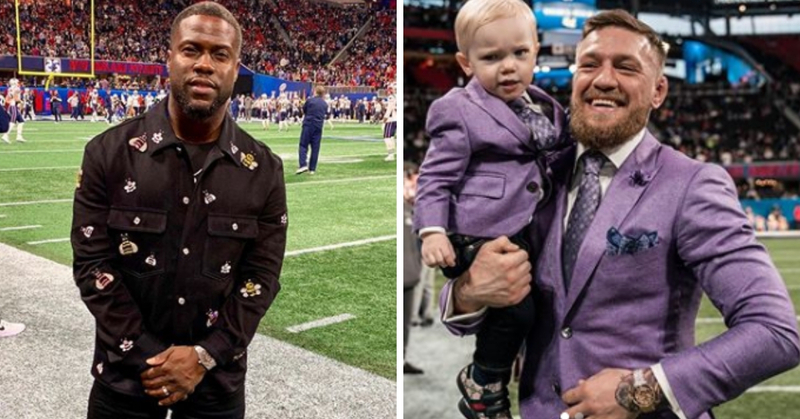 McGregor and his son Conor Junior, who was wearing matching purple suits, was in attendance at the Mercedes-Benz Stadium in Atlanta Georgia and showed some love for the Boston Patriots in the conclusion of the NFL 2019 playoffs. “We are live from the #SuperBowl in Atlanta! Stay tuned for the halftime surprise that the @nfl has for us! #NFL100,” he wrote on Instagram along with the photos above. In a video he shared to his millions of followers, the 30-year old mixed martial artist was seen sharing a light moment with famous actor and comedian Kevin Hart. McGregor said that the energy in the stadium was crazy before bumping into the 39-year old celebrity and his wife, Eniko Parrish. Thanks Atlanta for a great welcome and congrats to Brady and the Patriots on a Proper 12 win! The New England Patriots crushed the Los Angeles Rams in the lowest-scoring Super Bowl ever as they cruised to 13-3 victory, which surpassed Miami and Washington’s 14-7 tally in 1973. Football superstar Tom Brady, tagged as the greatest quarterback of all-time, won his sixth Super Bowl to become the winningest player in the league history. “It probably won’t sink in for a very, very long time. I’m just so blessed to play with the best teammates through the years from our ’01 tram and all the way through now,” Brady stated in the post-game interview. Other celebrities present at Super Bowl 53 were Sarah Michelle Gellar, Rio Ferdinand, Danny Devito, and Zombieland star Woody Harrelson.